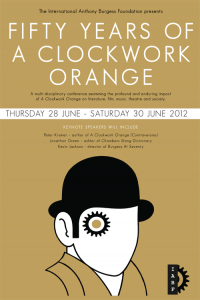 Fifty Years of A Clockwork Orange: full programme! 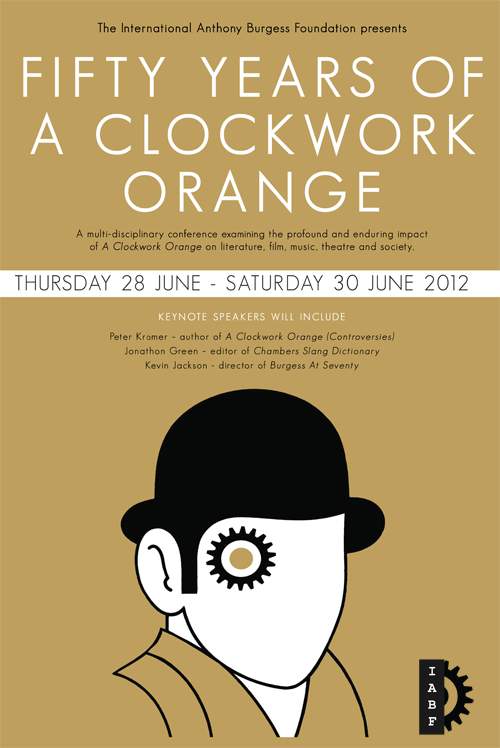 Here is the programme for the Fifty Years Of A Clockwork Orange conference to take place 28 to 30 June: join us for three horrorshow days of talks, lectures, debates, music and films. Full conference tickets are £70 from here. Concessions are £40 and day tickets are £25: please contact us directly on info@anthonyburgess.org or 0161 235 0776 to purchase these, or ask us anything about the arrangements. 6:30pm – Screening of the documentary Once Upon a Time… A Clockwork Orange (Antoine de Gaudemar, 2011) at Cornerhouse, Oxford Road. 6pm to 8pm – Wine reception and concert at the Burgess Foundation. The concert programme includes music for A Clockwork Orange by Anthony Burgess (1986) and A Clockwork Operetta (2011) by Kevin Malone. Joseph Darlington: A Clockwork Orange: The Art of Moral Panic? 6:30pm – Screening of Stanley Kubrick’s A Clockwork Orange (1971) at Cornerhouse, Oxford Road. Guy Cohen: Alex and Beethoven: music to watch violence go by? 6:20pm – 16mm screening of Andy Warhol’s Vinyl (1965) at Cornerhouse. Please note that the programme is subject to change and timings are to be confirmed. For conference delegates planning to stay in Manchester, please note that there is limited accommodation in the city that weekend. Please contact us for help in finding somewhere suitable.